I’ve once again endeavored to try and replicate one of the recipes of my childhood: My mom’s famous Mahshi. What is seemingly a simple recipe – only a few ingredients – is actually quite time consuming and difficult to make. Though some might call it a labor of love! My dad sent me this description: In the Arab world, the stuffing of vegetables has its roots in the cookery of the early Islamic empire of the Abbasids in Baghdad, possibly learned from the Persians. Ottoman chefs perfected the stuffing of vegetables, and today nearly everything that can be stuffed is stuffed from artichokes to zucchini. 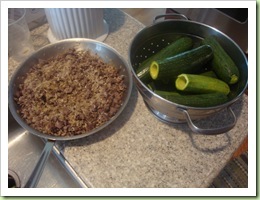 Making stuffed zucchini is a multi-step process, one I began this morning with my first cup of coffee, around 7:30am. 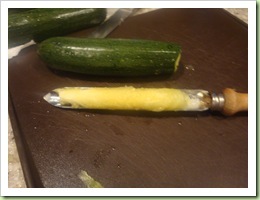 Removing the insides of the zucchini: The tool below is a zucchini corer. 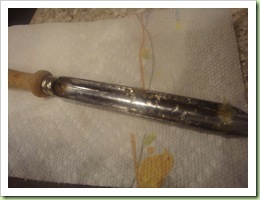 It will be your friend and enemy during the coring process. 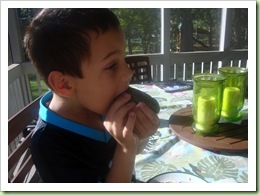 The trick is to slowly rotate the corer, slowly digging deeper into the zucchini until you pull out the insides of the zucchini in one big soggy log. Sounds easy, but rest assured, it’s not. It’s easier than you think to poke a hole in those little suckers… holes that will later ooze your stuffing. 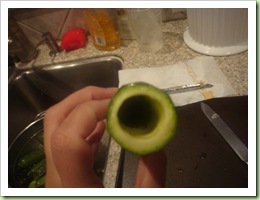 It’s also very important to remove as much of the insides of the zucchini as possible. 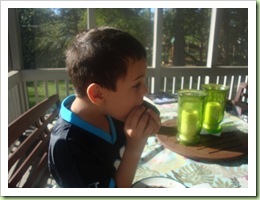 In the last picture above, I’m thinking I did a damn good job of emptying that zucchini. But alas, once cooked, most of my zucchini still had too much inside left – which contributes to a rather watery/soggy result. Better luck next time! 3. Next you need to stuff your (cooled) stuffing into the zucchini. I like it… stuffing the stuffing. This, too, is a process that requires a delicate hand! My mom said the trick is to only put in enough stuffing so that you can stick your pinky in and reach the stuffing. Remember…. the rice will expand! You may need to shake the zucchini to get the stuffing to settle to the bottom. 4. Now it’s time to cook these little stuffers. 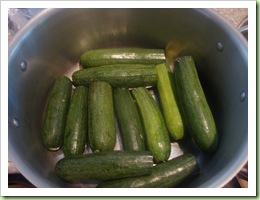 Lay the zucchini in the bottom of a pot big enough to hold them in a single-ish layer. Then blend a can (15 oz) of whole tomatoes and pour over your zucchini. Add about a cup of water to that, juice of half a lemon, and salt to taste. I had to use a little extra pureed tomato because I made such a large batch! Bring to a boil, cover, and simmer for about 45 minutes or so. You want the zucchini to be soft to the touch, but not falling apart. 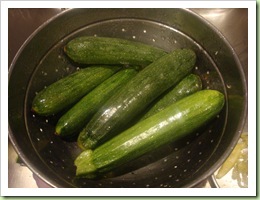 When the zucchini are done cooking, add one crushed (through a garlic press) clove of garlic. So, all told, it took the whole day to make my mahshi! I removed the insides of the zucchini at 7:30 in the morning. I made the stuffing after I picked up Erin from school 12:30. I stuffed and cooked them when we got home from picking up Josh at 3:00. Dinner was on the table by 5pm! What did I learn from this experience? 1)It will take a Herculean effort on my part to really remove enough of the stuffing so that my filling isn’t watery but without breaking through the skin of the zucchini. It’s damn hard! 2)My sauce could have used more salt. 3)I LOVE the way the house smells when the mahshi are cooking! 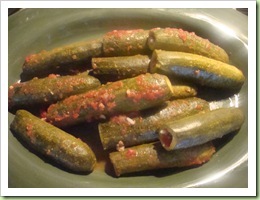 4) Nothing will ever taste exactly the same as when your mother makes it!